Wylie Buzza was named in the Cats' best. The Bendigo Bank Cats missed out on winning their first match of the 2019 season, losing to the Northern Blues by one point, 9.13 (67) to 10.8 (68). The Cats allowed the Blues to put the first goal on the board with an easy clearance and goal in the first minute. The Cats allowed the Blues five goals to two in the first and were then left with a big task at hand coming into the first break. 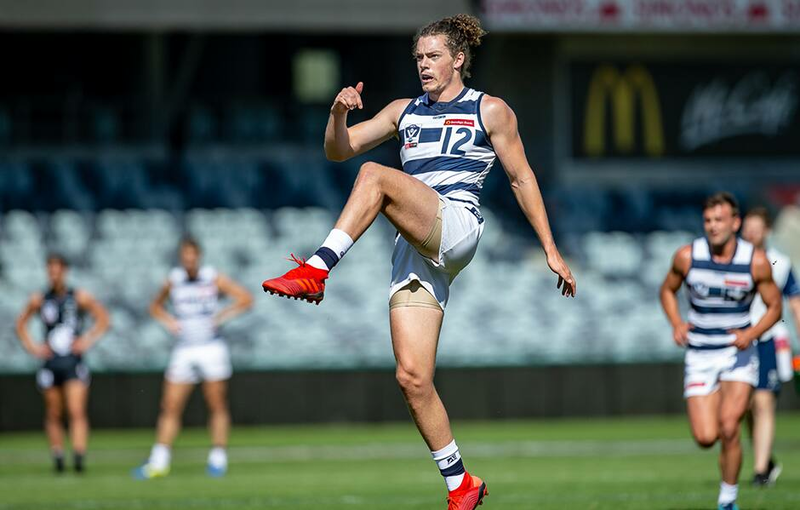 Geelong were able to find open pockets in their attack, and as pressure built in defence so did Geelong’s presence, finishing the first half three points ahead. The Blues took back the ball in the third, keeping the Cats scoreless for most of the quarter, Darcy Fort kicking his second and the Cats only goal of the third. The Cats came out blazing in the final quarter with two quick goals from Jamaine Jones and Oscar Brownless, however it wasn’t enough to secure the win, going down to the blues by one point. Cats coach Shane O’Bree commented on his team’s slow start to the game, but commended the side on their ability to come back. “It’s become a common trend where we lose control of the game at times, it’s more that teams are a bit zippier and get the handle on the ball a bit more around the contest. Which is something we’ve got to keep working on,” O’Bree said. After starting strong up forward and kicking the first goal for the Cats, Wylie Buzza was sent to the backline to apply the pressure to the Blues, and did so with composure. “We’re very tall up forward and we’ve had to develop players in different positions. The last quarter was the time to do it, Buzza is steady down in back. They’re the things we have to our advantage,” O’Bree said. Buzza finished the match with 18 disposals, 10 marks, and one goal. Another stand out for the Cats was key forward Darcy Fort with two goals at key times. “Fort is playing more as a permanent forward and he’s looking dangerous. He’s working on a lot of things on his craft and it’s coming out on game day. “He kicked two goals today, hit the post a couple of times, and probably could have taken a few more marks but that’s what he’s working on, his body positioning,” O’Bree said. The Cats were composed and had possession for most of the match, however it was the execution of ball to foot that allowed the Blues to take the game. “We definitely controlled the game, we had more of the ball, plenty of inside 50s. Probably just the finishing touches going in. “We did try to use the shorts, but the execution killed us there. That was the theme of the day, we had our chances, it was just our finishing touches and fundamentals that we lacked to really break the game open or hurt the opposition,” O’Bree said. Oscar Brownless was named in the best this week with an impressive game around the contest with 21 disposals and two goals. The Cats face a tough challenge in round three, travelling to Avalon Airport Oval on Saturday afternoon to play Werribee.